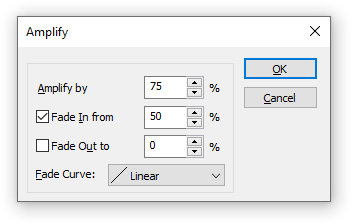 The Amplify Dialog is used to amplify section of a pattern or a sample. Amplify Amount: The percentage to amplify the selected data. When using this dialog from the Sample Display, you can enter negative amounts, which will both invert the sample phase of the selection as well as perform the amplification. Fade Type: Check one or both of the Fade Type boxes to have a ramped amplification enabled. When doing a Fade In, the amplification data is interpolated from the specified percentage to the amplified amount within the selection; Fade Out goes the opposite way. This page was last edited on 6 May 2017, at 17:57.